Café Music combines American and Canadian waltzes with Parisian musette - music played in European cities during the 1920's and 1930's. 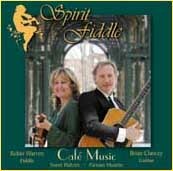 Released by Spirit Fiddle in May, 2003, the album features Champion Fiddler Robin Warren and guitarist Brian Clancey, accompanied by Bradd Wheeler on acoustic bass. The CD opens with Joyous Waltz, a simple Canadian waltz with European flavor. Bluebird Waltz provides a contrast with its complex harmonies and graceful transition to a new key. The US and Canadian A & E Waltz, Ashton Rose, Gold and Silver, and Jenny's Waltz feature 2 and even 3 fiddle parts, all played in harmony by Robin Warren. The well-known Ashokan Farewell, popularized by its use as the theme of Ken Burns' PBS Civil War Series, is recorded here exactly the way Brian and Robin play it in live performance. The musette tunes are typical of the era in which they appeared, combining Latin rhythms and hints of American swing with French folk tunes and Manouche gypsy music. Paris Musette, Tsonaise, Bernadette, Polka Chinoise, and Valse des Niglos represent this style. The sweet Beibin features some of Brian's melody guitar work, mixed with fiddle harmonies.